There are numerous causes or contributing factors which influence one’s ability to hear. Some of the most common causes of hearing loss include exposure to high levels of noise, aging, and hereditary factors or genetics. It is estimated by the National Institute on Deafness and Other Communication Disorders that about 25% of people ages 65-74 and about 50% of people ages 75 and up have disabling hearing loss. 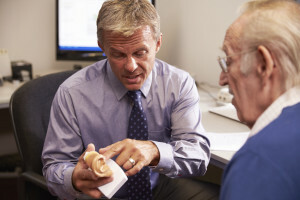 Why should I treat my hearing loss? When an individual has hearing loss, it affects not only that person but everyone they interact with. Hearing loss can be frustrating for spouses, relatives, friends, and even the clerk at the grocery store. Treating your hearing loss helps to improve your relationships and reduce stressful moments while conversing with others. Aside from personal relationships, research from Johns Hopkins University concluded that untreated hearing loss increases the risk of developing dementia. So, treating a hearing loss not only helps to solidify personal relationships, but may also help you live a better quality of life for a longer period of time! You can expect to have to adapt to wearing hearing aids especially if you are new to them. Even if you are an experienced hearing aid wearer transitioning into newer technology, this process should take some time. After this transition period you should expect to hear loved ones more clearly, enjoy watching television or movies again, and experience an overall increased quality of life. Hearing aids cannot provide you with “normal hearing” again, but we will do our best to make the experience as painless as possible.